You are currently browsing the tag archive for the ‘Jason Fischer’ tag. Gravesend is a post-apocalyptic zombie novella. 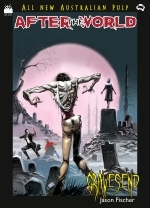 It is the second of a new Australian pulp series published by Black House Comics. While the series calls itself a “saga”, this has to be tongue-in-cheek, as the novella is an unlikely form for a saga. Fischer’s novella definitely builds on the previous one, however (set in an Australian law firm) and its action begins after the zombie plague has taken hold and the last of the healthy humans are under siege. The story is set in Kent in Gravesend (which is a pun that was inevitable the moment the subject of the novella was linked to the writing of Jason Fischer), and begins with the main character Tamsyn Webb on guard duty watching for zombies from a clocktower. It launches straight into the action with a mass zombie attack. Fischer then explains how the world has changed to become a place infested with the undead and how bleak the future looks for the villagers living in Kent. Things begin to get worse, as more people are killed by the zombies, but hope comes in the form of a transmission from America. Zombies are increasing in popularity all over the place. There’s Zombies vs Unicorns, World War Z, Zombie Racoons and Killer Bunnies, and YA romance zombies (can I just say, ick). Whether they want to eat your brains or take over the world or fall in love with your girlfriend, they are certainly a mainstay of horror writing all over the world. Australian publisher Black House Comics is cashing in on the current zombie craze with a new pulp series, After the World. One of my favourite Aussie writers, Jason Fischer, takes the helm with the second instalment of this series, Gravesend. Tamsyn is one of the few survivors trapped in Gravesend, Kent, after the end of the world. She and her father survived the initial zombie outbreak, but things are not easy behind the blockade in Gravesend, with food scarce and more zombies moving into the area every day. The survivors are trying to come up with options for the future, but after a disastrous attempt to contact survivors in London, and the situation worsening everywhere for the ragged remnants of humanity trying to endure the unendurable, things aren’t looking good. On top of a zombie apocalypse, Tamsyn is haunted by the horrific death of her mother, and what her death may mean for their survival.